This promising Souls-like is off to a shuddery start. Some things you should take into account before you buy Team Ninja's Souls-inspired samurai vs. demons brawler, Nioh. If you don't have a controller, don't buy Nioh. It doesn't recognise the mouse and the keyboard controls are unworkable. Nioh has in-game graphics options but the resolution and rendering settings are filed away in a separate launcher, which for me defaulted to a much lower resolution than my 1920x1080 display. The launcher ignored what I told it to change to for a few times, and seemed to randomly launch in windowed mode. It now seems to get the point. It crashed on startup the first time I tried to launch it this morning. The game sometimes runs as well as I'd expect on my GTX 970, Intel i5-4670K 4x3.4GHz CPU, 8GB RAM machine, and sometimes does not. Last night the opening level suffered from slowdown all over the place, and I couldn't figure out why. Today , however, on the second level it runs at a perfectly steady 60 frames per second. Your framerate choices are 30 or 60, you can't go beyond that yet. This is all for a game that, by modern standards, doesn't look amazing. I find myself happy to put up with the oddly aged visuals because Nioh does interesting things with its combat, but the gloomy unflashy visuals only increase my expectation for a solid framerate. It may run perfectly on your rig, of course, as some early Steam reviewers attest. If it does you will find an interesting combat game that owes a debt to Dark Souls while doing enough differently to warrant attention. You play a warrior called William, sort-of based on 'Western samurai' William Adams, who in this case learns samurai arts from a book he finds on a boat. He heads to Japan to battle demons and save the world. Combat is a lock-on slash and dodge affair in the Souls mould, but with a greater emphasis on quick combos and stance selection. Each of the varied weapons has a strong, medium and light stance. Strong stances give you big ponderous blows that sever limbs and sap stamina (or Ki, in Nioh's terminology). Medium stances allow you to defend more effectively and strike with wider attacks that can keep mobs busy. Light stance lets you blitz enemies down and dodge away immediately. You can replenish lost Ki after a combo by hitting the right bumper when William glows blue. If you hit it just so you instantly replenish and can continue your combo. It's like Gears of War's active reload, but for your arms. Weapon skills even encourage you to hit this marker and switch stance simultaneously for even more effective Ki recovery. This adds a strong skill element that also dictate's Nioh's swift combat rhythm. Strikes feel immediate, in an arcade way. 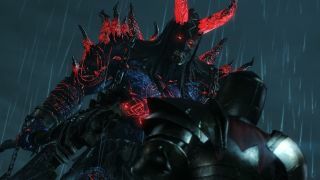 Souls combat is full of heft and timing, while Nioh is about dodging, then battering an enemy senseless, knocking them over and then executing them with a finishing blow. Combat is really carrying the game at the moment. The game is broken out into levels rather than knitted together into one contiguous world, and they have been dark and uninspiring corridor arrangements so far. Like Souls, when you die you resurrect at the last shrine you prayed at, and you can recover your lost spiritual currency if you make it back to your corpse. Don't expect any Soulsy lore intrigue and storytelling though., Right know my William has a big red valve on his helmet to celebrate the Steam release. I'm going to keep playing it, because I am a sucker for being able to draw samurai swords in a way that slices through enemies, and I'm looking forward to seeing how challenging combat really gets. If you're picking it up, keep an eye on the time so you can refund if it doesn't run well on your PC. We've reached out to Tecmo Koei to see if there's a patch planned.